I'm a bibliophile and also a librocubicularist Things I reviewed here are the books I've read in English only, but since it's not my native, pardon my poor grammar. This kind of genre is a new for me. What does it called...a dark humor? The story is about Laura Freedman, an English teacher, who suddenly absent from her class becaused she diagnosed of a mentally illness. Most of her students didn't care about it, but not Janice Gibbs. 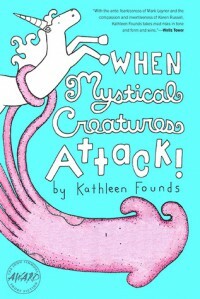 With an unique story-telling ways, Kathleen Founds told the relationships between the characters. Why I called this unique? Because we won't found an ordinary chapters like in other novels, but the story built by letters, emails, journals, short stories (mostly by Cody Splunk), essays and some therapy journals. And I love the humor (especially the "racist" Danny Ramirez!). The only thing from this novel is sometimes I can't recognized the POV. Some chapters didn't gave any clue about who's mind that I'm reading, which made me lost in track. Journaling Prompt: Write a one-page story in which your favorite mystical creature resolved the greatest sociopolitical problem of our time.